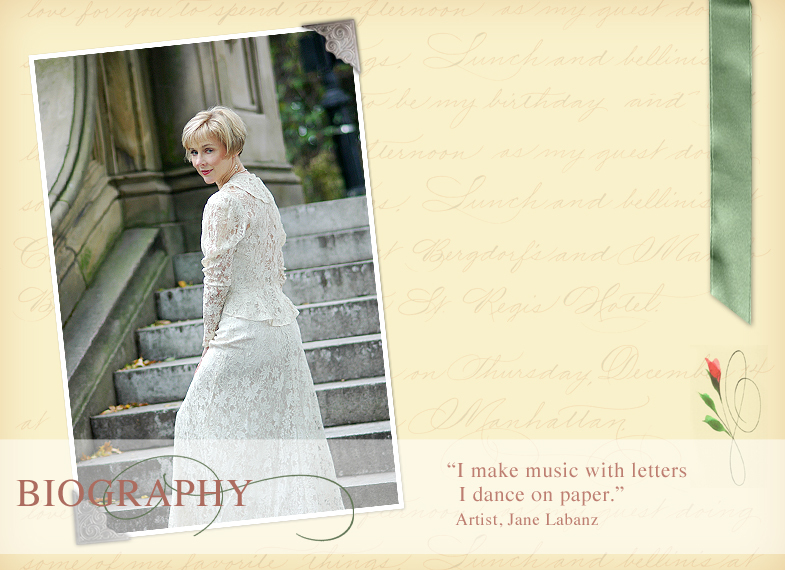 With each sweeping stroke, it is evident that Jane Labanz’s formal training as a concert pianist, vocalist and dancer, is the essence of her composition and the hallmark of her style. Her disciplined background, coupled with the element of musicality enhancing her work, makes her delightfully playful strokes undulate and dance. Refusing to be locked into a box, and believing, “All art is one art,” she creates in two very different worlds of scripts. She performs with drama and passion on paper, as well as on stage. As a member of Screen Actor’s Guild (SAG), Actor’s Equity Association (AEA) and American Guild of Variety Artists (AGVA), Jane provides film, television, theatrical, and advertising production companies with expressive live on-camera writing and “vintage” calligraphic props.